The space age was born out of the Cold War and took its first steps to meet national security and foreign policy goals of the United States and the Soviet Union. 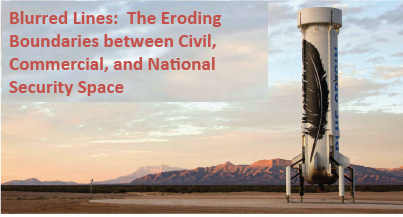 Over the course of the next several decades, the formation of a robust civil space/space exploration sector and national security space sector also formed strong boundaries between these communities. Over the last couple decades the commercial space sector has been focused on satellite communications and, more recently remote sensing also serving interests of civil and national security needs. However, in recent years, entrepreneurs, innovators, and investors have seized on the untapped potential of unique space applications that now blur the lines on what is driven and used by government and what is now of unique business interest with little to no government involvement. Areas once traditionally focused on by governments – space launch, human spaceflight, space situational awareness, space robotics, among many others, are now burgeoning commercial space sectors. Mr. Parikh will discuss these emerging areas, highlight the current and future “blurred lines”, and discuss the challenges and opportunities of how the U.S. Government is trying to encourage and capitalize on this renaissance in space for purposes that range from research and development platforms for space exploration to preventing a war in space. BIO: CHIRAG PARIKH is the director of the Office of Source Strategies at the National Geospatial-Intelligence Agency (NGA) . In this capacity, he is responsible for worldwide imagery collection operations and adjudicates requirements for all U.S. space-based imagery intelligence systems and works with industry partners to support U.S. civil and national security needs. Security Council. In this position, he was responsible for advising the President of the United States and the National Security Advisor on civil, commercial, and national security space matters supporting broader national security and foreign policy goals. He chaired interagency policy committee meetings, consisting of representatives from all Executive Branch departments and agencies dealing with space, to formulate and implement national space policies. He presided over issues that included developing plans to counter potential adversary efforts to destroy U.S. national security satellites, relaxing commercial imagery resolution thresholds, facilitating new space startups to enter the market, adjudicating issues on U.S. space launch developments and competition, and coordinating international space cooperation and diplomatic efforts. In 2016, Mr. Parikh was identified by SpaceNews as one of five space industry game changers from the around the world making a difference. Prior to 2010, Mr. Parikh served in a variety of roles to include serving as the Deputy National Intelligence Officer for Science and Technology at the National Intelligence Council and as a Principle Intelligence Analyst for Space Systems at the National Air and Space Intelligence Center. Mr. Parikh holds a Bachelor of Science degree in Aerospace Engineering from the University of Cincinnati.